Are you ready for a week packed with innovation and entrepreneurship? Pitt’s Innovation Institute and CMU’s Schwartz Center for Entrepreneurship are teaming up to bring their yearly week-long celebration of big ideas and student startups to both campuses. Between Nov. 13 and Nov. 17, Pitt and Carnegie Mellon together will host nine total entrepreneurship events, from competitions to discussion panels and more. 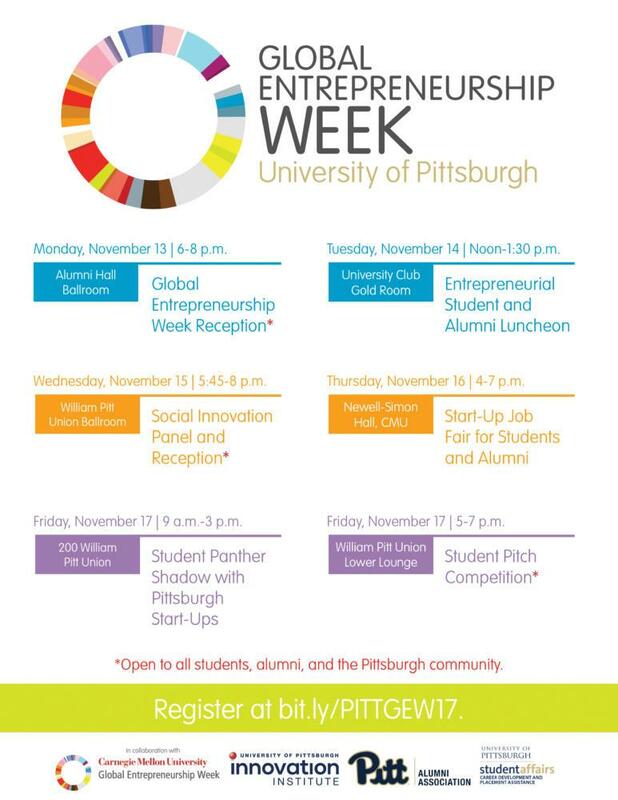 It’s going to be great, so consider this is your formal invitation to attend any of the many open events at Pitt and CMU’s Global Entrepreneurship Week. See schedule of events and how to register in the column to the right. One of the most innovative events going on this year is the “Money Table” on Nov. 10 and 11. You might be familiar with other innovation events, where graduate students from both schools test their mettle in the startup creation process. This turns that idea on its head: instead, student teams will fill the shoes of venture capitalists and angel investors looking to put money into a startup. Representatives from real startups will be in the hot seat, and it’s up to the students to ask them the important questions. This is a great way for student entrepreneurs to get “into investors’ heads” and start thinking about what they’ll be asked by real investors in the future. It will also be a lot of fun. The application deadline for graduate students from both Pitt and CMU to enter the competition at http://go.innovation.pitt.edu/the-money-table-2017 is Nov. 3. The teams will train on Nov. 10 in Alumni Hall, and the Money Table competition itself will take place the next day in CMU’s Gates Center. Another competition that’ll be a lot of fun and a great way to learn entrepreneurship skills is the Student Pitch Competition on Nov. 17, sponsored by the Pittsburgh chapter of the Product Development and Management Association (PDMA). This competition will test student entrepreneurs’ “elevator pitch” abilities: competitors will have just 90 seconds onstage to pitch an idea to an expert panel of judges. This event doesn’t just have cash prizes for the winners – they’ll also be given access to a variety of resources donated by sponsoring companies. The competitors have been preselected, but the event is open for everyone to attend. If you’re sure you’ll be there, you can register to attend at http://go.innovation.pitt.edu/pdmacompetition any day before Nov. 17. The competition will take place in the William Pitt Union Lower Lounge. The competitive spirit is great, but Global Entrepreneurship week isn’t just about competing. There will be a variety of panel discussions, TedX style presentations, and even a startup job fair that all students are welcome to attend. One of the coolest presentations will definitely be the Social Innovation Panel on Nov. 15, where founders of some of the most socially conscious startups in the Pittsburgh area will talk about how to build a successful startup that cares just as much about the community as the bottom line. This panel will take place in the William Pitt Union Ballroom from 7 to 8 p.m. A couple of the startups from the heart that you’ll hear from are are 412 Food Rescue, a great success story in crowdsourced food charity, and Rorus, a local company that makes affordable and effective water filters. This will be a “fireside”-style discussion, almost more of a conversation than a presentation. If you’re interested in entrepreneurship, social responsibility, or even just the success stories of a few local startups, you’ll definitely want to attend. These are just a handful of the activities that are planned for the week. The full list is available at http://go.innovation.pitt.edu/piw2017, where you can see descriptions for all of the events listed on this page. There’s such a variety that you’re sure to find something that interests you at Pitt or CMU. We look forward to seeing you there.